Our large, one pound wheat bunches will stand alone for a quick, ready-made centerpiece that needs nothing more to enhance its simple elegance. Simply remove the Mylar sleeve and bottom band (placed for shipping protection), and give the wheat stocks a gentle twist. 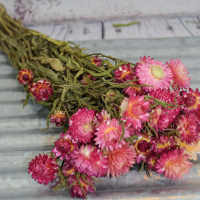 It will fan out to give a base for standing and make an elegant bouquet. 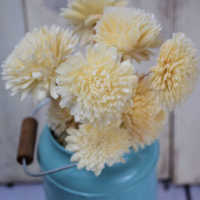 The wheat bouquet is suitable for centerpieces or for a display on a table, shelf, desk or curio. 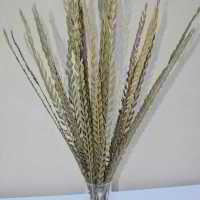 The large, one pound wheat bunch also does very well when placed in a vase or other container. The wheat will stay bright and as beautiful as the day it was harvested for years to come, placed in a dry, pest free area. Bring the elegance and bounty of the out of doors into your environment with a large wheat sheaf set on display for all to enjoy. Since wheat is harvested during the fall, wheat is often used for decorating during the fall time of year. However, the golden sunshine color of wheat brings a breath of the out of doors to brighten a winter day. Wheat also makes a beautiful, happy spring display, and brings the freshness of outdoors to any summer decorating scheme. By itself, or added together with other grains, dried flowers or leaves, a wheat bouquet will bring beauty to a home, office, party, reception or wedding, no matter what the season. Case options: Buy a full case of large dried wheat bunches and Save Even More! Length Note: Wheat length does vary each year. Some minor trimming with scissors maybe require for your individual project. This size is meant to stand on its own without support from a vase. Great table decorations for Weddings, Charity Events, or special occasions. For decoration only, not food grade. 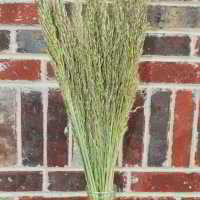 All Natural Dried Wheat, order your bundles of wheat and start decorating your home for the season today. Other Spellings: Center pieces, cheap centerpieces, discount centerpiece, weddings, bridal shower, church. Great Product!! Exactly what I was looking for Yay Yay Awesome product. 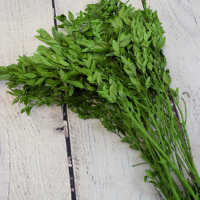 Strong stems, excellent quality, packaged very nicely, Happy with the order! Very Pleased, exactly as expected or superior to expectations! The dried wheat bunches were exactly what I wanted. They are well made and beautiful as well. I would definitely order from DriedDecor.com again. Perfect size for the piano and stands on it's own! Thank you! I rec. my order in plenty of time and I so appreciate your expediency and packaging was wonderful as well! Great product and fast delivery. I much appreciate your service. Keep up the good work. This wheat is beautifully preserved and I thought it was perfect for my bridesmaids' bouquets. Exactly what I was looking for. Dried decor processed my order very quickly even so close to Christmas. I was so pleased with my order. Their merchandise is all I used to decorate my winter wedding and it was perfect - absolutely breathtaking. The product looked exactly as advertised. This is a beautiful product.Fast service and exceptional value. Would definitely order this products again. Beautiful website that is easy to navigate! Beautiful blonde wheat, cannot wait to use for my wedding! Shipped quickly! I loved the wheat..It's beautiful and arrived without any breakage was very pleased with the products! I'm so excited to use these as bouquets for my Jr. Bridesmaids. Super full bunches, no crumbling. Great care went into ensuring these were packed well. Nature is perfect! I'm so impressed with the beauty and condition of this wheat. And the packaging was excellent - no damaged stalks whatsoever. I love how beautiful they look in my home - and DriedDecor is the only source I'll use in the future! Thank you so much! Boy am I glad I found you - and thanks to good old Google too! Great product, I received the wheat stack exactly as you see it on their web site, perfect packaging. Thank you. The packaging in the box was excellent and arrived per my request. All in tact and the same way as you view it on their web site. Thank you Dried Decor. What a great product for the price and quality. Exactly what i was expecting and GREAT, fast shipping ! Cannot wait to use this at my wedding!! Exactly as expected and pictured. Arrived very well packaged and looking just as beautiful as I wanted them to be! Arrived quickly and as portrayed. The company judging by this experience is doing an excellent job! Loved it, I'm going to order a case. Fast shipping, website is easy to use. These are absolutely gorgeous and exactly what I had hoped for.This is the first order I have placed with Dried Decor and I'm extremely pleased with everything I ordered. Thank you so much! Everything in my order was exactly as described or better and my order was shipped promptly. The product was exactly as pictured online. Very well done. The service of your company is indeed exceptional. I was so pleased that my order arrived so quickly. Your company does provide exceptional service, and I do appreciate it. The product was in perfect shape when I received them and they made awesome decorations for my son's wedding reception. I will definitely order again from DriedDecor. The items I purchased were outstanding quality. Product arrived on time and was as described. Used these for my wedding and they looked great. The product looked exactly as advertised. I am very satisfied with my purchase. Quick, courteous service. Just what I was looking for. I'll make my order larger next year. I'm so glad I found your site. I will be referring to it through out the year. Thanks. 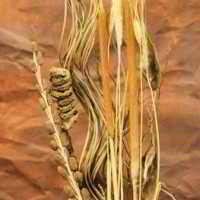 The stalks of wheat are going to look fabulous for our Country Fried Jamboree centerpieces.. Quick delivery and lovely items! Full, rich, gorgeous. I put it in a red handled jug and it looks great!!! Just received the wheat and it looks exactly as expected. I can't wait to use it for my wedding arrangements. Pretty,full,wheat bunch. Needed to trim stems so it would stand. excellent service and shipping! Exactly what we wanted. Felt very satisfied with the product. Overall the products were phenomenal and of great quality. Enjoyed what we got, and will use again for more of our event staging, promo photo/video. Thank you!! I use this product to weave Brigit's Crosses. They work well for this weaving project. Prompt shipping and great quality. Even though I ordered late for my project, I got the product promptly enough to make my deadline. Thanks! Just what I Wanted for my fall mantle deco project! This item was reasonably priced, easy to purchase and shipped within the parameters of my timeline. Thank you. Product was what I expected and I think it will work well. Large, beautifully crafted product. Carefully packed and easy to use. It was a item sold by my cub scout troop as a traditional Ukrainian "didukh" placed in the house at Christmas as a symbol of the earth, renewal, life and plenty. The items were a big hit with the community. I have not done the project I wish to do, but I will soon. The wheat is just perfect. Wheat was super beautiful. I will for sure be back. What I expected, I thought shipping was kinda of pricey though. 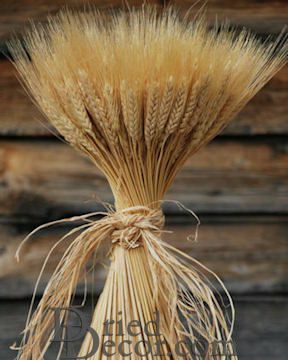 The dried wheat was in very good condition and was just what we wanted for use in wedding bouquets. Packaged well but still a little crushed. Should be ok once I fuss with them a little. Four stars for receiving the wrong item but it was corrected quickly by a very nice customer service person. I will use you again! Product was what we needed and worked well. Glad you have it available. Your shipping costs are OUTRAGEOUS!!! The dried wheat is beautiful, but I feel that the shipping took a but longer than anticipated I love the decor they offer! Can't beat the quality of the products either! The wheat looks real and is good quality. I would order this again. Fast service and exceptional value. Would definitely order any of these products again. Very nice quality. Wish the bundles were larger. The wheat was beautiful. .
Great color and quality, large bundle, easy to stand, and not skimpy! Easy to navigate and good quality! I was truly pleased. Created my wedding bouquet out of the wheat and lavender. Amazing! Will shop again!